Another grey trouser?? you’re saying right now. But no! This is completely different. Black Fleece by Brooks Brothers has a lovely black and white Prince of Wales check on a wool and cashmere trouser that I found myself admiring more than a little at the Bleecker Street Black Fleece shop a few weeks ago. Like blackwatch tartan, the Prince of Wales check is another pattern I find myself drawn to this fall. Fun fact: the pattern — also known as glen plaid — is called Prince of Wales because the Duke of Windsor popularized wearing it when he was the Prince of Wales. Similarly in love? Find them here. You should know that while I have a distinct weakness for Black Fleece — which is essentially all that I like about Thom Browne with a dash of wearability — I definitely think it is a smidge overpriced. Hence the “StapleSplurge.” My best Black Fleece scores have been thrifted. I might tell you where, if you ask really nicely… If $350 is a bit steep, try these from Paul Smith (on sale! ), these from Incotex (also on sale! ), or these from Banana Republic. 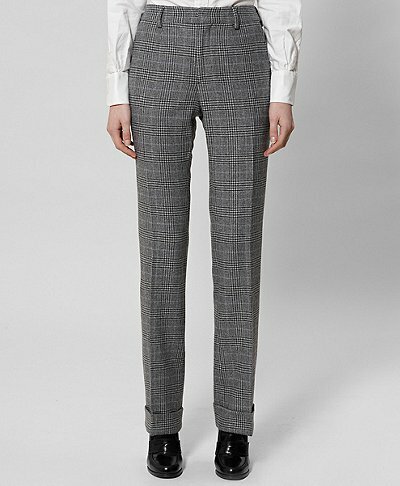 You are currently reading Fall StapleSplurge: Prince of Wales Check Trouser by Black Fleece at Quite Continental.